Twilight meets the legend of Atlantis in this gripping graphic novel from writer Joelle Sellner and artist Abby Boeh. After the death of her beloved mother, Aryn’s father has moved her family to a new town hoping for a fresh start. At first things seem to be going well—Aryn is making friends and has even caught the eye of one of the hottest guys in school. But there are dark forces moving under the surface that Aryn cannot see; and her new crush may not be … human. Mer is such an amazing comic book! Joelle Sellner captures the heart of the teen voice which pairs equally well with the illustrations drawn by Abby Boeh. After the death of her mother, Aryn's dad moves their little family to Connecticut. A new school means Aryn has to start all over and make new friends and a new life for herself. She makes quick friends with Julia Silverglade. She also happens to move in next door to the ultra hottie, Adrian, who is a little more than human. He and his friends, Rafe and Tressa, are Mers from Atlantis. The story progresses quickly and even so I didn't want it to end. Aryn is fierce and sassy, the kind of character I love to read about. She struggles with the grief of losing her mother, but the friendships she forges help her get through it. The romance between Aryn and Adrian is exactly what you might expect from YA relationships, gushy and squeal worthy! I hope there's another volume coming after this one, because this story was not enough. The snarky, quirky characters made Mer a fun read that can't be missed. 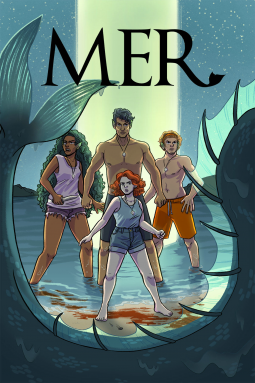 I recommend it to everyone, especially YA readers who love the mythology of mermaids and other fantastic sea creatures.